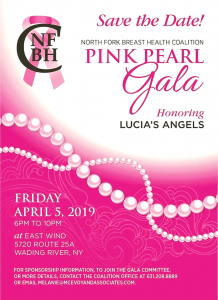 The North Fork Breast Health Coalition’s (NFBHC) Fifth Annual Pink Pearl Gala will take place on Friday, April 5 at East Wind Long Island. Associate Bernadette Tuthill is a committee member of the all-volunteer, nonprofit organization that supports local breast-cancer patients with programs such as Helping Hand grants. The funds raised by the gala will allow the group to continue to provide free services to breast-cancer patients and survivors. People can also make a donation or buy a ticket to be given to a survivor or their caregiver to attend.